Healthcare: Are we demanding bad goods? Details is a trendy American style magazine showcasing movie stars and the latest in everything fashionable and chic. So when they name a health economist as one of the 50 most influential men under 45 it should raise a well-groomed eyebrow (or two). As if that doesn’t give him enough credibility, David Cutler is one of the most-cited minds in modern health economics with a persistent focus on driving the discussion of quality. Modern Healthcare recently said he is one of the 30 people likely to have a significant impact on the future of healthcare. Plus he’s a professor at MIT and was an advisor to U.S. Presidents Clinton and Obama. In short: Cutler is a big deal. 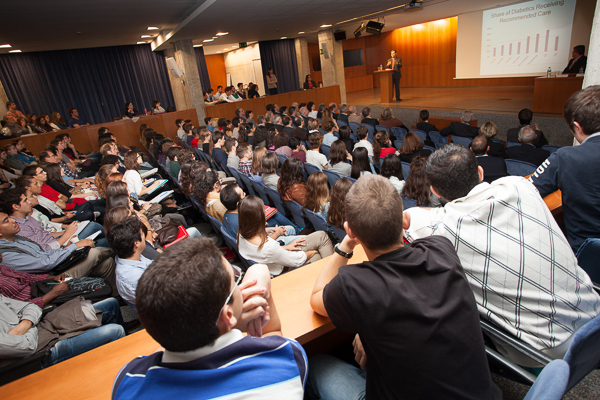 If the UPF, and ostensibly the Barcelona GSE want to prove the profile of their economics program, attracting this star to inaugurate the academic year could be an indicator of success. The auditorium filled to standing-room only shows the opportunity was not lost on students either. Author scottgrobertsonPosted on 16.11.2012 27.11.2018 Categories Economics of Public PolicyTags David Cutler, healthcare systems, incentives, lectures, policy, United States, UPFLeave a comment on Healthcare: Are we demanding bad goods?